​In 1887, W.W. Duson founded Crowley in southwest Louisiana. The city soon earned the nickname of the "Rice Capital of America.” Recently, rice and crawfish have become the mainstays of the Cajun town. Crowley and the neighboring town of Rayne have had small but significant Jewish communities. Successful Jewish businessmen were not limited to nearby Lafayette, some resided in Crowley and Rayne. One such entrepreneur was Alphonse Levy, president of the Opelousas Mercantile Company, a land holding company, which held vast acreage in Crowley. Notably, Jacob Frankel was the first merchant in Crowley and one of its first settlers. Frankel was a Jewish immigrant from Poland who came to America in 1878. After working as a clerk in the store of J. Meyer and Company of Opelousas, Frankel arrived in Crowley in 1887 and began a merchandising business by the name of J. Frankel and Company. Within a decade, Frankel sold out to Maurice Heymann, a prominent Jewish businessman in Lafayette. Frankel was a staple of Crowley’s community. He was the town’s first postmaster, a member of the first city council, treasurer of the parish, vice president of the Crowley State Bank, and vice president of the Crowley Rice Milling Company. Today, one can still see the sign for J. Frankel’s 1901 store in downtown Crowley. In nearby Rayne, Mervine Kahn’s 1884 department store quickly grew to a million-dollar-per-year business. By providing such a boost to the city’s economy, Kahn was personally responsible for growth of Rayne; he even founded the Rayne State Bank in 1884. Today, it is possible to visit Kahn’s historic merchandise store and restaurant in Rayne. Perhaps no story from southwestern Louisiana quite captures the apparent contradictions between business interests and traditional Jewish customs quite like that of Jacques Weil. Along with brothers Edmond and Gontran, Jacques came to Rayne from Paris in 1901. Their business quickly became astonishingly successful. Restaurants and universities around the country clamored for their decidedly non-kosher product: frogs. This was no laughing matter. Around 1900, the Weil brothers were shipping 10,000 pounds of frog legs around the nation, each week. 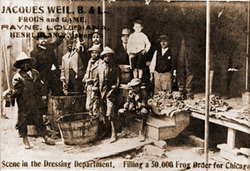 Weils hired local Cajuns—black and white—to skin the amphibious delicacy and prepare them for shipment. Crowley’s Jewish residents attended services in Lake Charles until 1904, when Congregation Emmanuel was formed in Crowley. Although no synagogue was built, services were conducted at the Masonic Temple. At first Dr. L. Warshaw of Lake Charles conducted services, but in 1906, Nathan Michnick became the first resident rabbi. By 1907, the congregation numbered over 100, with Jacob Frankel serving as congregation president. Among the 28 active members of the congregation were: Daniel Blum, Joseph Blum, Abrom Kaplan, Jefferson David Marks, William Marks, Jacob Mayer, L. Sternberger and Mervine Kahn of Rayne. Services were held weekly on the Sabbath and conducted in English. The small community even boasted 24 students in its religious school, as well as a B’nai Brith chapter, a Ladies’ Aid Society and a Young People’s Temple Society. By the end of World War I, though, the Jewish population of the city had declined by 50%. Soon, Congregation Emmanuel disbanded and its remaining members from Crowley and Rayne joined the congregation in Lafayette. Ever since the decline of Congregation Emmanuel, Crowley and Rayne’s Jews have been a part of the Lafayette Jewish community.